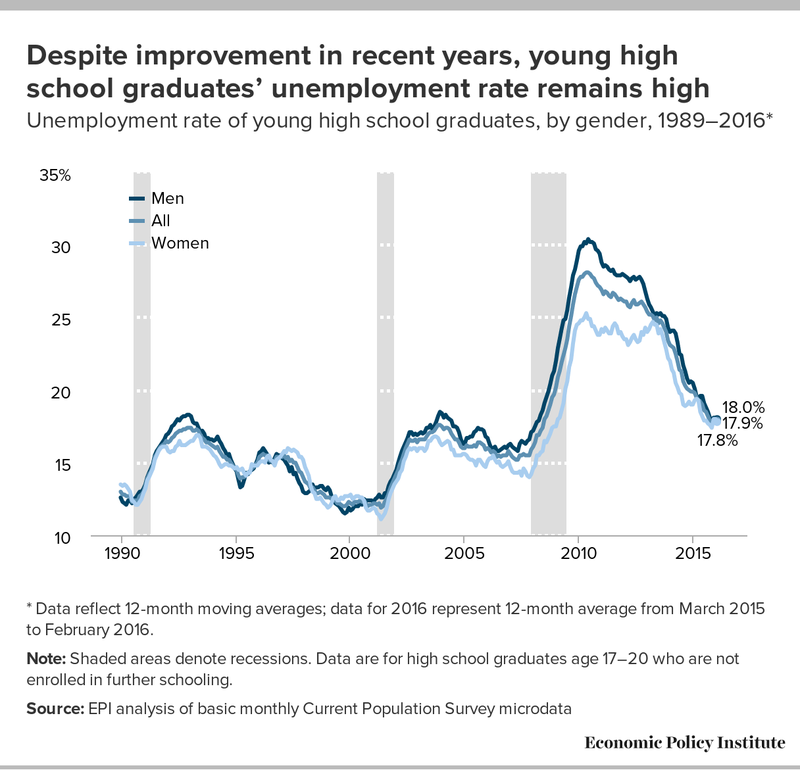 Our recent report on the class of 2016 showed that young high school and college graduates still face high levels of unemployment and stagnant wages, even though the labor market has improved since the Great Recession. Between these two groups, however, young high school graduates face a far less forgiving economic reality: the unemployment rate for young high school graduates is over three times higher than their college-educated peers (17.9 percent versus 5.6 percent), nearly one in seven is stuck in a part-time job when they really want full-time work, and the wages of entry-level jobs have barely budged since 2000. * Data reflect 12-month moving averages; data for 2016 represent 12-month average from March 2015 to February 2016. Note: Shaded areas denote recessions. Data are for high school graduates age 17–20 who are not enrolled in further schooling. There are clear economic advantages for young people with a college degree relative to those who do not pursue and complete a college degree. This often leads pundits to suggest that more education is a solution to the low wages and high unemployment facing non-college educated workers. While this could be good advice at the individual level, encouraging more people to pursue higher education will do little to address the ongoing wage stagnation experienced by both high school and college graduates. When considering the role of increased college enrollment in economic prosperity, it is useful to distinguish between two problems. One is inadequate social mobility, or the fact that it is difficult for children from low- and moderate-income families to climb to higher rungs on the income ladder. Policies that increase college enrollment are primarily focused on improving upward social mobility, because people who complete college earn more than those who only have a high-school degree. The second problem is rising inequality, which is reflected in persistent wage stagnation for most workers, including both high school and college educated workers. Young college graduates face stagnant wages and higher levels of unemployment compared with the young college grads of 2000. Entry-level wages for young college graduates have stagnated over the last 16 years, and have even fallen for some groups—young female college graduates’ wages fell 6.8 percent since 2000. Recent graduates also face lower-quality jobs: young college graduates with pension coverage fell from 41.5 percent in 2001 to 29.4 percent in 2015. Note: The age 17–20 cohort includes only those workers who are not enrolled in further schooling. Wages are in 2015 dollars. Shaded areas denote recessions. Will increasing college completion help end wage stagnation? 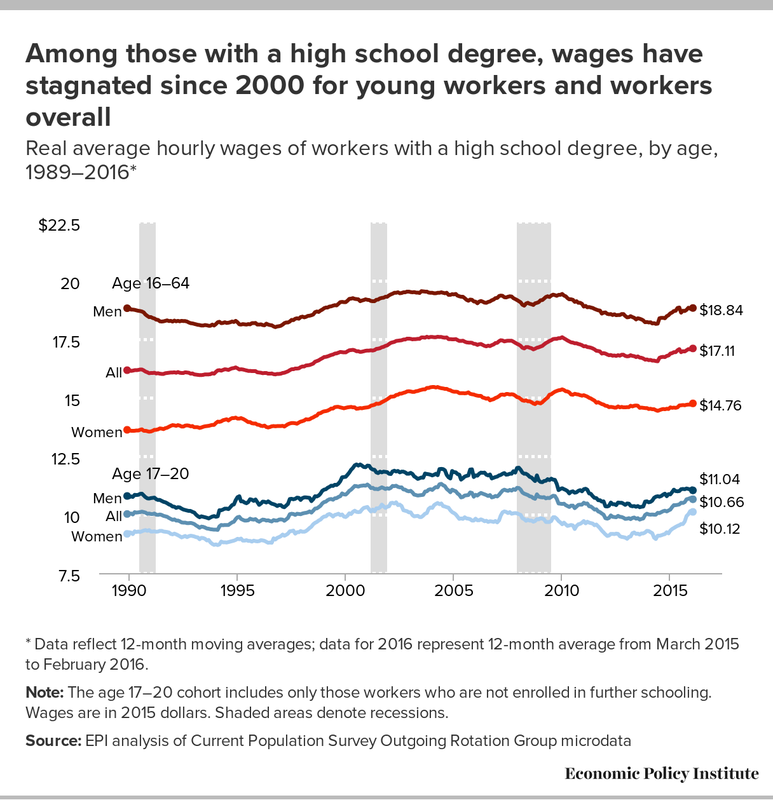 For current college graduates, the increased supply would only add to downward wage pressures, while lessening the supply of workers without a college degree can modestly lift that group’s wages. But rather than focusing solely on increasing the number of people pursuing college degrees, we need to make sure both high school and college graduates have jobs that provide robust wage growth. This can be achieved through the policies outlined in our Agenda to Raise America’s Pay, which include raising the minimum wage and eliminating the tipped minimum wage, strengthening the right of working people to collectively bargain, and ending discriminatory practices. We should also never forget that these two problems are tightly connected because inequality exacerbates inadequate social mobility (it is well established that economic inequality can impede educational achievement, and we know countries with less inequality have more upward mobility). So, even if your goal is to increase mobility and “opportunity” it is essential to end wage stagnation and ever-rising inequality.